Preventing or reducing the impact of potentially traumatic events that can have negative, lasting effects on health and well-being. These experiences range from physical, emotional, or sexual abuse to parental divorce or the incarceration of a parent. Use the form below to contact Samantha Pinzl about Adverse Childhood Experiences. There are 10 Adverse Childhood Experiences (ACEs). The more ACEs an individual has, the higher their ACE Score and the greater their risk for long-term consequences. The prevalence of ACEs is staggering. Nearly every community feels the medical and social burdens of subsequent behavioral and physical health problems, including depression, suicide, heart disease, diabetes and early death. There is hope for healing, however. 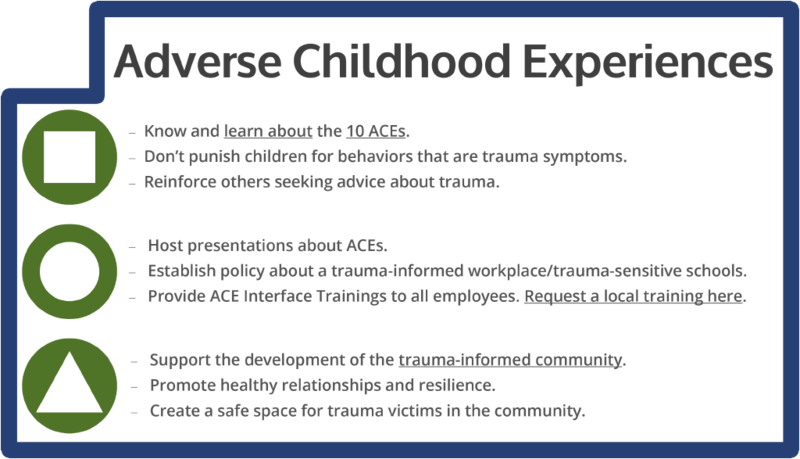 Start by understanding ACEs and their effects with a FREE Wisconsin ACE Interface training. To request a training, contact any of the Certified ACE Interface Trainers below, or you can fill out the training request form below and one of the trainers will get back to you about your request. Please fill out the form below to connect with our certified ACE Interface trainers to request a training.